When composing a sales email template or a snippet, it's important to add components that are personalized based on the recipient. In templates and snippets, you can add tokens that correspond to your recipient's contact, company, deal, or ticket properties. Please note: creating a sales template or snippet with curly brackets instead of personalization tokens causes issues with HubSpot's rendering service. Before saving your template or snippet, remove any curly brackets. In your HubSpot account, navigate to templates or snippets. Click the name of the template or snippet to edit, or create a new template or a new snippet. Click into the body of your template or snippet where you want to insert a personalization token. Click the Token dropdown menu. Click the Type dropdown menu and select a property type (you can choose a Contact, Company, Deal, Ticket, or Sender property type). Use the search bar to enter a name of a property, and then click the property to insert the token. 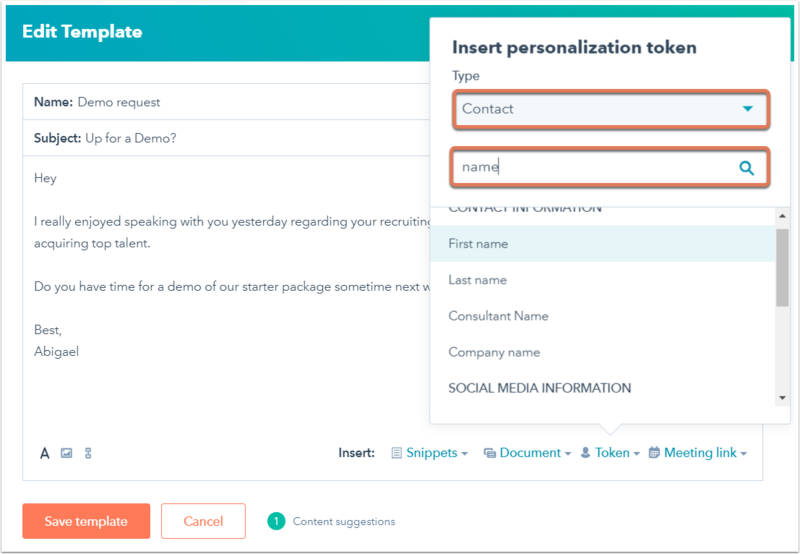 Please note: if you want to add the name of your contact's associated company to your template or snippet, you should add the company token, Name (or Account Name if you are Salesforce integrated). This is different from the contact property, Company Name. Learn more about the difference between these two properties.